The Athanasian Creed is the third and longest of the “ecumenical creeds,” those statements of faith widely confessed by Christians of many denominations. Most of us know it best from the custom of using this creed during the service on the Festival of the Holy Trinity. The precise origins of the creed are somewhat obscure. It was probably written in Southern Gaul (France) at some time in the late fifth or early sixth centuries, but we do not know the name of the author. Just as the Apostles’ Creed is so named, not because it was written by the apostles, but because it faithfully summarizes their teaching, so the Athanasian creed accurately portrays the position of Athanasius, Bishop of Alexandria, who defended the orthodox view in the great fourth century controversy over the proper understanding of Christ. We can divide the creed into two parts. The first portion deals with the doctrine of the Holy Trinity, and the second with the doctrine of the Incarnation of Christ. In each case the creed addresses specific errors. As regards the Trinity, two heresies are tackled, Sabellianism and Arianism. The former bears the name of the third century teacher Sabellius, who taught that the Father, the Son and the Holy Spirit are merely three manifestations of the one God, so that at one time He appears as Father, then at another as Son and at yet another as Spirit. The creed condemns this error as “confounding the persons” of the Trinity. Arianism developed from the teaching of Arius in the fourth century that the Son is created and inferior to the Father. This error the creed condemns as “dividing the substance” of the Trinity, stressing that each person is uncreated, each is infinite and each is eternal. It is possible the creed also has in mind Eutychianism, which goes back to Eutyches in the fifth century. He was so zealous in countering Nestorianism that he was accused of confessing only one nature of Christ, and allowing no room for His humanity. Again the creed declares our Lord Jesus Christ to be “equally both God and man—God from the Father’s substance, man from His mother’s substance”. The creed’s value is in clearly explaining the Bible’s revelation about the triune God and about the incarnation of Christ. In this it is as relevant and valid today as ever it was. Many Christians, however, feel uncomfortable about confessing the creed in church. There are two reasons for this. First, the impersonal and philosophical language it uses to describe God, and perhaps especially Jesus, is incongruent with the intimate and personal relationship to which we are invited in Scripture. However, the creed is forced into such precise formulations to resist those false ideas that would rob Jesus of His humanity (Eutychianism), or of His individuality (Nestorianism), or of His proper divinity (Arianism) or would rationalise away what the true God has disclosed about Himself as distinct from every human speculation about our Maker (Sabellianism). Although the names of these “isms” are drawn from centuries past, their ideas are destined to resurface in any generation because they are all, in their way, reasonable and rational, although wrong. More seriously, Christians may be troubled by the dire warnings this creed pronounces upon those who depart from its teachings. For it says that in order to be saved one must hold the catholic faith it expounds both about the Trinity and about the Incarnation. We might react, this goes well beyond the requirements set down in the reassuring words of St. Paul, “If you confess with your lips that Jesus is Lord and believe in your heart that God raised him from the dead, you will be saved” (Romans 10:9, RSV). But the errors rejected in this creed attack the very confession that Jesus is Lord. Each one threatens the truth “that God was in Christ, reconciling the world unto himself” (2 Corinthians 5:19, KJV). The Athanasian Creed is the guardian of this saving truth. 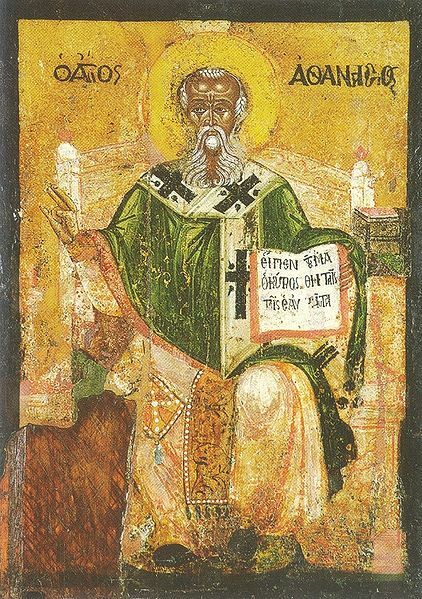 You can read an older translation of the Athanasian Creed online here for free. For an up to date translation that’s easy to read, check out The Book of Concord – A Reader’s Edition from Concordia Publishing House.